John Eccles was a neurophysiologist. He was awarded the 1963 Nobel Prize in Physiology or Medicine for showing how messages pass between nerve cells in mammals, including humans. It was already known that these messages could be excitatory or inhibitory. Eccles discovered that both excitatory and inhibitory processes are chemical in nature, rather than electrical. Andrew Huxley and Andrew Alan Hodgkin, who were working independently in the same field, also won one-third shares of the 1963 Nobel Prize. Santiago Ramán y Cajal won the 1906 Nobel Prize in Physiology or Medicine for proving that neurons (nerve cells) are individual, separate cells. The gap between individual neurons was later called the synapse. In the years following Cajal’s discovery fierce debates broke out among scientists about how signals cross the synapse from neuron to neuron. Some scientists said messages were carried by electricity, while others claimed the process was chemical. Supported the theory of electrical transmission. Inserted tiny glass micro-electrodes into cats’ spinal neurons, allowing him to measure electrical activity within individual neurons. Stimulated neurons in the spinal cord, precisely controlling the stimulation. Discovered the electrical theory he supported was wrong, but he was not disappointed: he had learned from Karl Popper that falsification of a theory is the hallmark of good science. 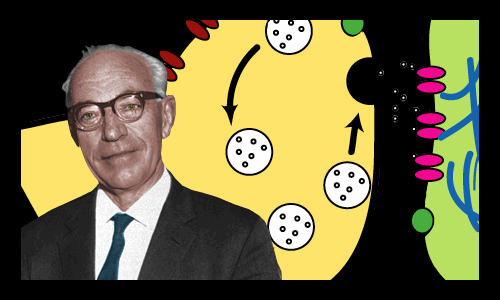 Eccles found that both excitatory and inhibitory messages between neurons were chemical processes involving sodium and potassium ions. John Carew Eccles was born on January 27, 1903 in the city of Melbourne, Victoria, Australia. His father was William James Eccles and his mother was Mary Carew. Both were teachers. John was homeschooled to age 12, as were his two sisters. He attended Warrnambool High School and Melbourne High School. He won a scholarship to study Medicine at the University of Melbourne, where he enrolled at age 17. An enthusiastic athlete, he broke the Australian Universities’ pole vaulting record. Eccles graduated from Melbourne with first class honors in 1925, age 22. A Rhodes Scholarship took him to the University of Oxford, where he was awarded a PhD in 1929. His research work was supervised by Charles Scott Sherrington, whose work on neurons earned him the 1932 Nobel Prize in Physiology or Medicine. Sherrington coined the term synapse to describe the gap between neurons, and he was a powerful influence on Eccles’s future work. Despite an age gap of 46 years the two became close friends. After the award of his PhD, Eccles continued research work at Oxford for a further eight years, then returned to Australia. 1937: Director of Pathology at the Sydney Hospital, Australia. 1944: Professor of Physiology at the University of Otago, New Zealand. 1952: Professor of Physiology at the Australian National University, Canberra. He described this time as his scientific golden years: he completed his Nobel prize winning research and published over 400 papers. During his time in New Zealand, Eccles enjoyed exchanging ideas with the philosopher of science, Karl Popper. Eccles claimed his future work was strongly influenced by Popper’s view that scientific progress is maximized when scientists put forward big, bold, challenging theories with sufficient content to be falsifiable. Eccles was a Christian and occasionally a practicing Roman Catholic. He believed in a Divine Providence that operated over and above the materialistic happenings of biological evolution. Eccles was known to his friends as Jack. In 1928, age 25, he married the New Zealander Irene Frances Miller, a devout Catholic. The couple had nine children: five daughters and four sons. One of his daughters, Rosamond, became a neurophysiologist and worked with him. In 1968, when Eccles was 65, Australia’s Civil Service forced him to retire from his job. Eccles moved to America to continue working. At the same time he divorced Irene and married his colleague, the Czechoslovakian neurophysiologist Helena Táboríková. In America he became estranged from his large family in Australia. During his career, Eccles published 19 books (12 as sole author) and more than 500 scientific papers. At age 72, he retired and, with his second wife, Helena, relocated to the small Swiss town of Contra. In retirement he wrote prodigiously on the mind-brain problem, which had fascinated him for most of his life. Sir John Carew Eccles died, age 94, in the hospital in Locarno, Switzerland on May 2, 1997. He was survived by Helena and buried in Contra, Switzerland. "John Eccles." Famous Scientists. famousscientists.org. 16 Mar. 2018. Web.